Mary Theresa (Gould) Wright – in Woburn, April 12th. Beloved wife of the late James F. Wright. Devoted mother of Daniel R., his wife Heidi of Easton, MD, James F. “Jay,” Jr. of Santa Clara, CA, Alan J. of Waltham, Linda M. Alberts, her husband Ron of Merrimack, NH, Margaret M. Wright of Woburn, Patricia M. Ariansen, her husband Joe of Needham, and Scot F. of Woburn. Loving “Nana” of Taylor, Teresa, Jaquelyn and Rebecca Wright, Kari, Michael, Ryan and Robert Alberts, D.J. Wright and Alyssa Ariensen. Cherished “great-nana” of Jade and Lucas. Dear sister of the late Robert and Donald Gould, and sister-in-law, of Joan and Marie Gould, Bruce and Susan Wright of Arlington, Mary and William O’Keefe of Mattapoisett, and Barry and Kim Wright of NC. Also survived by many beloved nieces and nephews. A Funeral will be held from the Lynch-Cantillon Funeral Home, 263 Main Street, Woburn, on Thursday April 18th at 9 a.m. Followed by a Funeral Mass in St. Barbara Church, 138 Cambridge Road, Woburn, at 10 a.m. Interment in Woodbrook Cemetery, Woburn. Relatives and friends are respectfully invited to Calling hours, Wednesday, April 17th, 4- 8 p.m. Remembrances May be made in Mary’s honor to St. Barbara Church, 138 Cambridge Rd., Woburn, MA 01801. Mary (Gould) Wright, passed away at her home, with her beloved family by her side Friday, April 12th. Mary was the loving wife of the late James F. Wright. Born in Cambridge Mar y was the daughter of the late Daniel H. and Margaret V. (Ford) Gould. Mary was a graduate of St. John’s High School, furthering her education at Boston College, graduating with a Bachelor’s Degree in 1957. In 1960 married the love of her life Jim Wright, a true gentle man who she met on a ski trip several years earlier. They settled in the West Side of Woburn, where they made their home and raised seven children! Both Mary and Jim were very proud of all seven of their children and took great pride in all of their interests and accomplishments. As life moved along and the children married, her greatest role was that of “Nana,” taking a great interest in all that they did whether they lived near or far….Nana’s heart was with them all, all of the time! Once the children were in school, Mary had taken on a part time position as Secretary at CMARC, which lasted over a decade. She absolutely loved her job there and they loved her. Mary then went to Wakefield Concrete, where she retired from in 2002. Mary and Jim travelled to Ireland and had enjoyed cruises in the Caribbean and Mediterranean. Mary was very involved with St. Barbara’s Church. Faith and family were most important in Mary’s life. From teaching CCD to all ages, being a Lector, and Eucharistic Minister, where Mary served the Rehab, and anywhere she was needed. Mary would always take the time and have little conversations with those whom she was visiting. Mary was also an intricate part of the Ladies Sodality at St. Barbara’s and took part in all of their activities. A very thoughtful, kind and unconditionally loving woman, Mary’s life was full. Her life centered around her family and her faith; providing Mary with great joy and blessings throughout her life. Funeral will be held from the Lynch-Cantillon Funeral Home, 263 Main Street, Woburn, on Thursday April 18th at 9 a.m. . Followed by a Funeral Mass in St. Barbara Church, 138 Cambridge Road, Woburn, at 10 a.m . Relatives and friends are respectfully invited to Calling hours, Wednesday, April 17th, 4- 8 p.m. Interment in Woodbrook Cemetery, Woburn. Remembrances May be made in Mary’s honor to St. Barbara Church, 138 Cambridge Rd., Woburn, MA 01801. A Funeral will be held from the Lynch-Cantillon Funeral Home, 263 Main Street, Woburn, on Thursday April 18th at 9 a.m. . Followed by a Funeral Mass in St. Barbara Church, 138 Cambridge Road, Woburn, at 10 a.m . Relatives and friends are respectfully invited to Calling hours, Wednesday, April 17th, 4- 8 p.m. Interment in Woodbrook Cemetery, Woburn. 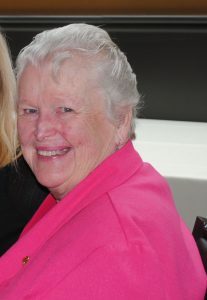 Remembrances May be made in Mary’s honor to St. Barbara Church, 138 Cambridge Rd., Woburn, MA 01801. Stop all the clocks, cut off the telephone……put crepe bows round the white necks of public doves, let the traffic policemen wear black cotton gloves. She was our North, our South, our East and West, ……. The stars are not wanted now; put out everyone, pack up the moon and dismantle the sun, Pour away the ocean and sweep up the wood; For nothing now can ever come to any good. This poem expresses the feelings I feel for my Aunt Mary. My Dads only sister. My little sister Pattys Mother. The only relative who set the Gould Family on their feet again when we lost all… Her love of God and family I can only try to emulate. To my cousins.. You know we know your heartache. We are so sad for your family’s loss. Our prayers are with you all during this time. Mary, I’m so glad we had a chance to meet. Patty is a wonderful girl and I know you and Jim had a big influence on her life. She is a welcome addition to our family. God Bless you and deservedly, Rest in Peace. Aunt Mary was kind, generous and loving to everyone. She was the guiding light for her family and she will shine even brighter for all us from heaven.